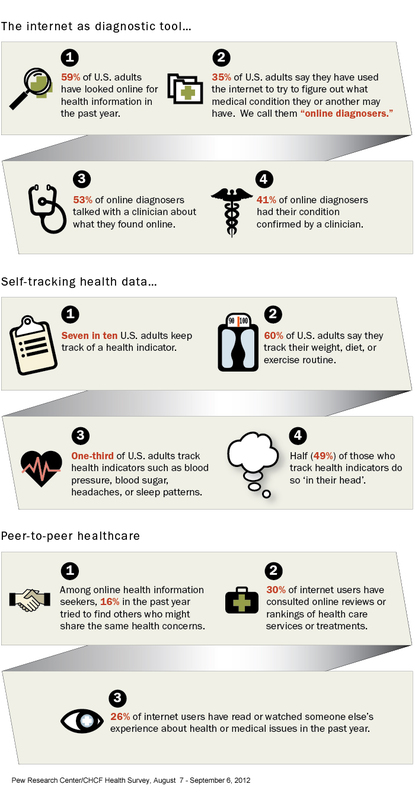 81% of U.S. adults use the internet and 59% say they have looked online for health information in the past year. 35% of U.S. adults say they have gone online specifically to try to figure out what medical condition they or someone else might have. 39% of online health seekers say they looked for information related to their own situation. Another 39% say they looked for information related to someone else’s health or medical situation. An additional 15% of these internet users say they were looking both on their own and someone else’s behalf. 60% of U.S. adults say they track their weight, diet, or exercise routine. 33% of U.S. adults track health indicators or symptoms, like blood pressure, blood sugar, headaches, or sleep patterns. 12% of U.S. adults track health indicators or symptoms for a loved one. Fore more information on the reports and data associated with these findings, please see: 2012 Health Survey Data.